Wow…that is quite a list! You can use this as a checklist while you are studying. We will be focussing on the ones in red for next week’s test. I’ve put together a practice test (Sakai Resources > Classwork > Molecules and Solutions. Please use the Practice Test VoiceThread (see the VoiceThread menu in Sakai) to share your answers with others or to ask questions as they come up. I will post the answer key on Wednesday. Astronaut Scott Kelly is spending a year in space on the International Space Station, and his Russian counterpart cosmonaut Mikhail Kornienko is doing the same thing. On Sept 15 they reached the halfway point of the#yearinspace. The major purpose of the #yearinspace is to learn the demands the human body requires to make the trip to Mars. You can find more information here. 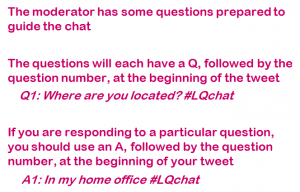 Since most of you have not participated in a Twitter chat before, I put a few tips together. This is an optional activity, but I recommend it. You will have the opportunity to ask real scientists questions! Click on the Log-in link in the top right corner and enter your username and password. To tweet, click on the Tweet button in the top right corner of the window. Don’t forget to add the #SciStuChat hashtag every time! Use the Q & A format. I will be following along with you! Good luck!